Upgraded 802.11ac Wi-Fi was supposed to be faster. Mountain Lion is limiting it. Apple unveiled a refreshed MacBook Air for 2013 at this month’s WWDC event in San Francisco. The ultra-thin notebook computers were made immediately available to consumers following the Company’s announcement on June 10. Unfortunately, early adopters are already reporting problems with the new computer’s Wi-Fi. The Mid 2013 MacBook Air update boasted some impressive new specs over its already highly regarded predecessors. These include beefing-up the Air with Intel’s latest Haswell processors, bumping battery life to between nine and 12 hours, and upgrading the Wi-Fi to 802.11ac. The change from the previous Air’s 802.11n to 802.11ac was claimed to speed up wireless connections by up to three times. However, instead of the speedy downloads and buffer-free streaming that new MacBook Air buyers had anticipated, some have been left with choppy connections and slower-than-expected speeds. Initially, the tech blog Gizmodo had reported that “thousands” of new MacBook Air users were posting complaints on the Apple Support Forums, similar in nature to what its own staff members were facing. Now, it appears that the connectivity problems are not hardware related. AnandTech ran some real-world tests on their 2013 MacBook Air using iPerf, software that allows users to measure bandwidth performance. The program showed that the new Air offered a connection of 533Mbps. But when the author tried testing the connection by transferring a movie file to a friend, the connection lagged down to only 169.6Mbps (21.2MB/s). Digging deeper, AnandTech discovered the culprit: The operating system itself, not a wonky antenna or too-thick plastic housing, was holding the new machine back. Interestingly, ArsTechnica was able to get around the problem – but not within OS X. After launching Windows through Boot Camp, the 802.11ac Wi-Fi was able to achieve speeds 218 percent faster than when Mountain Lion was running. According to an unnamed Apple source, 9to5Mac reported that Apple Store “Geniuses” were instructed to “capture” affected MacBook Airs. Some customers were allegedly offered replacement computers in-store, while others were given complimentary USB-to-Ethernet adapters to avoid using the slow internal Wi-Fi. 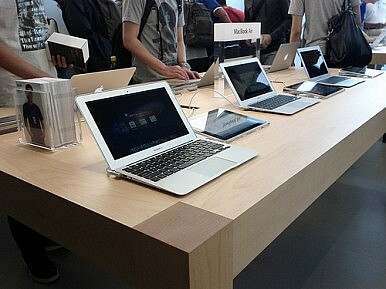 Apple has not independently confirmed that the current MacBook Air is indeed flawed and no recall has been issued.